With the messy look of those "crabs in a bag," it's great to know that you could just pop in next door and wash your dirtied shirt (dirtied with cracking open the messy shell fish)! I feel mildly disappointed that they don't have any other sides other than "one" corn on the cob and "one" Cajun sausage. They should have potatoes at least, or maybe some cornbread to go with the crawfish. But I guess the caked-on seasoning mess constitutes a side dish in and of itself. It's certainly not a meal for everyone. It's a good thing they gave me a bib...juice and guts everywhere! Seasoning stuck underneath my nails. Sweat beading up my brow. Aliens is exactly the movie I was thinking of...you really get close and personal with these things, more so than lobster or shrimp. I know! I was sooo bummed there were no potatoes! And I thought it was kinda weird that they just don't include a corn and sausage for every pound of crawfish bought, instead of just the first. But I guess that's how they keep the price low and how they can earn some incremental revenue on offering extra corn and sausage. 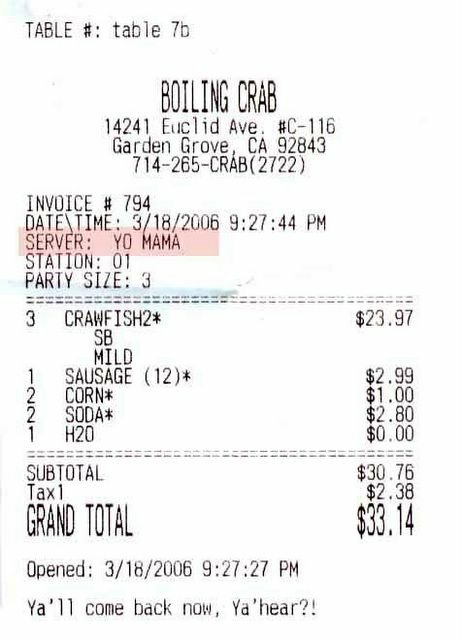 By comparison, one place I used to go to a lot in Long Beach, called Crab Pot, included everything -- shrimp, clams, crab legs, sausage, corn and potatoes...but they charged a flat $25-$30 per person!!! HAHA! That comic is hilarious! I think I remember a similar cartoon appears on Boiling Crab's wall as a poster. It's definitely more visceral and messier in practice. My taste and tactile memory of that experience is still vivid even though my visit was more than 2 weeks ago. They have blue crabs and shrimp sold by the pound too...I am definitely going to try them next. I think the most cost effective in terms of meat to dollars would be the shrimp. The crawdads tail meat accounts for only 20% of the total weight. Perhaps Yo Mama is the Vietnamese answer to YoYo Ma. I think I am going to nominate this post for some food blogging award next year. LOL! You are a great master of the tale and you survived the onslaught of the aquatic aliens. And, it has to be someone's mama, no? If Yo Yo Ma's mother was named "Yo", she'd have to introduce herself as "Yo Yo Ma's Mama, Yo". Yeah, presentation is definitely not their strong suit. The soft drinks come in cheap fast-food sytrofoam cups. I'm also betting the jambalaya is served on Dixie plates. Thanks Seth! But I think your Mastro's post is going to edge me out. I'm still savoring every word of your post as I type this. Elmo, i've never tried crawfish but I definitely want to now. Contrary to what others are saying about the plastic bag presentation - I like it! But seeing as how crawfish is mostly shell and head, I doubt anyone will have leftovers. "Cajun-style", "Vietnamese-owned"...just the thought of that is so intruiging that it makes me wanna check it out! That potential of Cajun and Vietnamese fusion was pretty tempting for me too. Although I don't know if there's much Vietnamese flavor in the food, the prices are definitely indicative of a typical Vietnamese dive. LOL! Amen! If were possible for the crawfish to be eaten whole, like I do shrimp, I'd a done it! Tastegasms?! I think you just coined a brilliant new word! Oh man. When I went N'awlins last summer to visit my one big Vietnamese uncle, the one thing I wasn't able to eat were crawfish. Crawfish, unfortunately were out of season. Cajun and Vietnamese go together just like my big boy Uncle Loi. ;) I'm gonna try and check this place out. I think "Yo mama" is the coolest server's name. But if I had a server name, it'd be "Yo mama's mama!" Oh snap! ahhh, disgusting the meal may sound and as alien as they may look the messy mudbugs were DEEEE-licious! i'm from New Orleans myself and this stuff is even better than MY mama's! 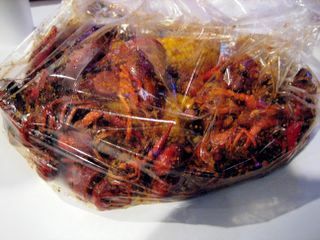 The plastic bags were not as "unappetizing" as Mealcentric thinks..especially once you see these beautiful mudbugs marinating in the spicey juices.. *licking my lips*..besides i think a place like this doesn't need good presentation.. the cool jams and good eats for that price was well worth the drive from LA. I'm just left wondering if they have "Yo'Mama" ...you think there's a "Yo'Daddy"?! Yo mama! Yo daddy! Yo kids! Everyone should like these bugs! just catching up on your posts. i love this one. 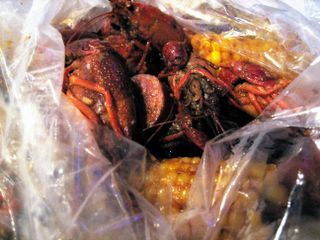 the last time i had a crawdad boil was in houston, tx. i'm really happy there is one just south of LA, los angeles, that is. As far as I know, the family that owns it used to hail from Houston. So this is the real deal! i have been to this restaurant and is really kick back. you can get down and dirty and no one will be looking at you weird. what is so nasty bout putting seafood in a plastic back? i personally think is way cleaner than plates. it is a fun enviroment because everyone is laughing and having a good time getting their hands dirty. $2 BEERS? that is way cheaper than most places. the price cant get any cheaper for seafood and they arent cheap with their portions like most restaurants. they may not serve so much sides but hey you know their food is off the hook when the waiting list is up to an hour or more! YOU WANT POTATOES THAN GO TO RED LOBSTER OR OTHER SEAFOOD RESTAURANTS AND PAY 20 BUCKS MORE. after all they are known for their crawfish not pototoes or anything else! the only comment for this place is you gotta go try it yourself. If you can't handle the spices then may be it's best to leave for those who loves it. Trust me i can admit this addiction. My woman and I are hooked on this place. We get 2 pounds of the whole sha-bang crawfish, 1 pound whole sha-bang shrimp, and she just has to have her lemon pepper shrimp. That's 4 lbs between the 2 of us only! Oh yeah, we usually stop by Cajun Corner as well to get some clams since this place doesn't serve clams. What can I say, what my baby wants, we go..:) You do get sausage and corn for 1 pound at CC. Gotta try the Long Beach spot though. It was about back in september when I first read this blog. I have been completely addicted ever since. I go almost every week and I live 50 miles away from the place. If you have never gone there, I would advise ordering your seafood "whole she-bang" and Medium heat. my personal order is 2lb. crawfish and 1 dungeoness crab. Garden Grove location now offers, Shimp etouffee, Fried Catfish, Cajun Hotwings, Cajon fries. The oysters are a great value around ($1/oyster) served cold over ice with lemon/salt pepper and g-sauce which tastes like worstershire and ketchup. Beers, you can't beat the price at $2 a bottle. Crawfish are awesome and your server lets you know if they are previously frozen or not.. Don't be scared off by frozen ones because while they are not as good as fresh, they certainly don't dissapoint. Boiling crab is a place you will either probably not like or become completely obsessed with. this place is FABULOUS! the way the food's eaten might sound disgusting and dirty, but everything's made very cleanly and tastes delicious (if you can handle the spice). it's finger food, not the end of the world...and you can always wash your hands afterwards. if you're looking for good food and a comfortably casual atmosphere then this is the place to be. and if you haven't tried it, don't insult it. 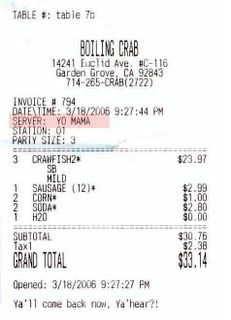 Great Review - just visited The Boiling Crab #2 last night (3/30/07). My lips are still tingling from all the red pepper and garlic. It was great. The shrimps were huge! any information on how about opening a crawfish restaurant anyone? Thanks everyone for the great comments. I'm a regular at this place, and have made regulars out of the people I tell about it. I know there are a lot of crawfish restaurants popping up all over the place, and I'm not quite sure who started it all, but this one a personal fave. As for starting your own crawfish restaurant, well, all you need is just a good place, a good recipe, and a lot of cold beer! We went to the one on Brookhurst for the first time and we loved it! I was very impressed, little bit of a wait but well worth it. 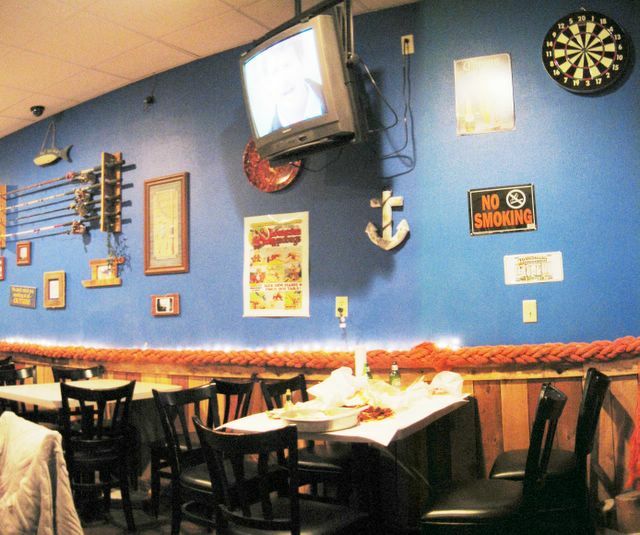 Great service, atmosphere, and of the course the best food and reasonable pricing. We did not try the one on Euclid, reason rude service with a girl that answered the phone. Can't wait to go back to the one on Brookhurst. to passionate eater...they do have other sides...cajun fries and they do have potatoes...along with a few other things. The only thing best about this place is a lot of girls come here other than that service is really bad. They would charge you like an american service but service like crab. Party of 6 or more will get charge 15% of gratitude in the bill but will make you wait untill you have no appetite to eat or enjoy the food. Check them out and you will see. Their service is really bad. Hope they would change their service attitude to their customers. I'm sorry, but I live in Westminster, the heart of Little Saigon, and there is NOT a laundry mat next door. I was there last night for dinner with a group of 9 and the bill came out to be over $200. We ordered two orders of oysters and four bags of craw dads and a round of beer. It's just an OK place - don't know if I would go back though. There are two Boiling Crabs in the Little Saigon area. You went to the one in Westminster. This one is in Garden Grove. There's a laundromat next door. My apologies. You're right. I didn't even notice that the title of your post is Boiling Crab - Garden Grove. haha. Love the place though! I absolutely love their fresh oysters. The sauce they use is great and the oysters are so fresh. Actually, let me take that back. They have two Garden Grove locations. the one on Brookhurst is actually considered Garden Grove as well. That's the one I was talking about. You're right! The other one *is* in Garden Grove as well! But yeah, this one's on Euclid, two doors down from a laundromat. Haven't tried the euclid location, but had gone to the Broookhurst one, nurmerous times. Serivce is good most of the time and the crawfish is the closest it'll ever come to being in New Orleans. we went to the one in Brookhurst yesterday and boy was it good. The service was good I guess it helped that our server was the same server my cousins had when they went to the one in Euclid. We brought rice since it seems it was fine to do so. Next time we go we are bringing vinegar for those seafood LOL. The oysters were so fresh and good, the crawfish and the shrimps. really good! i went here bout a month ago and true to your words man .. it's really an hour or so wait time but it's totally worth it ... hands down to their shrimp in shabang sauce ... the whole experience is a mix of andrew zimmern and anthony bourdain's show .. weird but good! So I finally decided to make a comment on the site. Being from Louisiana, I figured this would be a good time for me to chime in. 1. A pound a person?!? When ordered at a restaurant here, most people order 2 - 3lbs. If you're throwing a crawfish boil at your house, plan for roughly 5lbs per person. 2. I'm very surprised they didn't offer potatoes. However, the garlic boiled in the same water is awesome. Believe it or not, a mirepoix can offer a lot of flavor to it, with celery making a surprise showing. Boiled onion is awesome too. Carrots, well... meh. I've seen numerous things done, from halved lemons to hotdogs. 3. 7.99?!? Are you kidding? I've gotten spoiled I suppose because even with "steep" prices, we're looking at around 3.79 a pound right now. And this is with them in short supply as it's still early in the season. 4. Served in a plastic bag is typical. When purchased here, they are put into a plastic grocery store bag, then into a brown paper bag. For the big orders I bring my own buckets. 5. Ironic as it may be, my girlfriend's favorite place to get crawfish from is a vietnamese owned shop. I feel that their seasoning is jussssst about embarassing compared to a real pot of crawfish but I don't give her too much hassle over it. Elmo, Houston is NOT the real deal, sorry. I feel bad about y'alls seafood prices if this is conisdered a deal or $1 oysters is exciting. However, it looks like they're seasoned well and I'm glad y'all are getting to enjoy a little "Lousyana" love. You people are not very bright just because there is no mention of other sides does not mean there are no other sides. 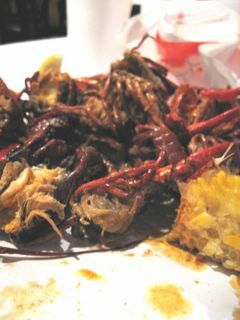 In fact they not only have crawfish they have boiled and fried crab, fresh and fried oyster, as well as crab. They also have Cajun and Sweet Potato Fries, rice, and they do have potatoes which i am pretty sure is mentioned in the review so read closer Passionate Eater Moron, the "caked on" seasoning is THE REASON people eat at boiling crab. Overrated place that has grown too much in popularity without the establishment being able to catch up with service and tables. Hostess and guards act like Vegas club bouncers. They act like you need them more than they need you. For cheap-priced seafood, they sure act like their product....cheap. I went there & waited FOREVER for a table....i thought the "serve your food in a bag" was ghetto and cheap but when i tried the food sumerged in the whole sha-bang sauce i didnt care anymore. Delicious. I love seafood, spicy and lemon accompanied by a beer. For the skepticals, take a chance...you never know unless you try. If you don't like you know for sure & you dont have to return. I do recommend. The Boiling Crab is the best seafood I've eaten in a long time. Service was excellent and prices are extremely reasonable. I think the negative comments come from competitors. Sorry, I'm not fooled. If you want quality food, fun filled ambience, excellent pricing, go there.